After a cold, dry, sunny May, we are having a warmer, dry, sunny June. 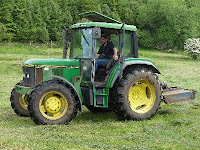 There has been no significant rainfall since last Autumn and watering the garden has been added to the list of chores. There haven’t been many years in the twenty that I have lived here, that a tractor has been able to go onto the fields without the wheels sinking into the bog. Because of the dryness and the cold air, we had a temporary reprieve from the midges but they are now making their presence felt on still evenings. There has been plenty of less annoying wildlife to enjoy, some of it close at hand in the conservatory. A swallow hitched a ride on the model osprey, hanging from the ceiling and a willow warbler investigated the windowsill. A roe deer enjoyed the fresh grass at the back of the workshop and a dragonfly was seen having just emerged from it’s nymph state. The cast nymphal skin is left hanging on the tree. The air has been full of mating damsel flies. While out fishing, they were landing on us and all over the boat. On the domestic front, the chicks hatched in April are getting bigger every day but the jury is still out on the gender. The wild flowers are fabulous at this time of year. My favourite is the yellow flag iris which flowers profusely in June. Water liliies are flowering on the lochs and the bright blue swathes of bluebells along the woodland margins are being replaced with fields showing bright yellow with buttercups. A particular feature this year has been the volcanic ash which has shown up in thick yellow bands where the water levels of the lochs have dropped. The bands look as if they have been painted onto the rocks and posts. The lack of rain allowed it to settle rather than washing it away. The garden has been demanding a lot of time this month and things are starting to grow well but so far we only have rhubarb, salad leaves and turnips to eat. The garlic is almost ready to harvest and there are tiny embryonic courgettes appearing which will magically transform overnight into monster marrows. All too soon there will be the two months of abundance and all the work of dealing with the surplus. 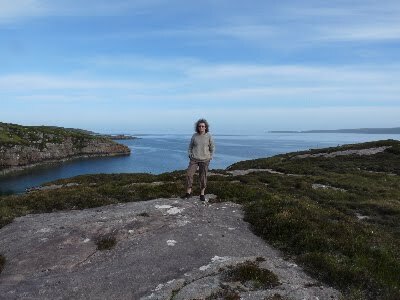 We managed to get away for a short break this month, taking the campervan up to Applecross. It was an exciting journey over the Bealach na Ba, probably the steepest road in Britain, complete with hair pin bends and vertigo inducing drops. I was glad to be the one driving with the steering wheel to hang on to rather than sitting in the passenger seat next to the edge of the mountain. I was so concerned that the elderly VW wouldn’t make it, that I didn’t have too much time to worry. The scenery was stunning with high, vegetation free mountains, quite a contrast to the tree clad, gentle hills of Knapdale. 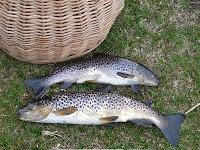 Two fine trout provided a good dinner one evening, camped high above the Sound of Raasay. It is now a year since Norwegian beavers were introduced to Knapdale and we have six beavers remaining in the trial area. 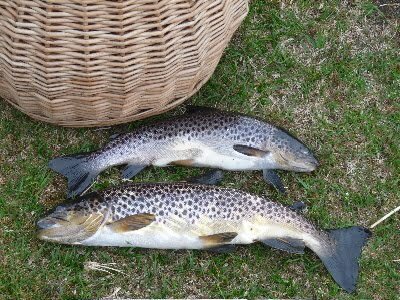 An additional pair were put onto the Lily Loch, close to Seafield at the beginning of May. Early reports suggested the beavers were ‘settling in brilliantly’. Two weeks later, project workers failed to observe the male beaver but were still getting a signal from the radio tag. It was another 9 or 10 days before the adult male was discovered dead in the artificial lodge on 27 May. Coincidentally, this was the time when the media were very interested in doing anniversary broadcasts and articles but no word of the death was released by the Project and the anniversary press release was upbeat and very positive about the whole enterprise. News of the death was not released for a further two weeks. Another beaver, removed from the trial last December has also died in Edinburgh Zoo. That brings the confirmed death toll to 12 and there are another 3 missing, presumed dead. That makes 15 beavers dead or missing out of a total importation of 25. And the effects so far? A small addition to the body of water in an area renowned for it’s wetland habitat, the felling and flooding of many hundreds of trees with the consequent loss of habitat and the removal of a popular walk due to beaver flooding. Is that really worth £2.5 million (so far) and all the stress to animals and humans alike?